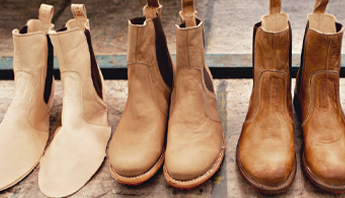 We honor the craft of traditional shoemaking, while striving to be 100% natural and organic in the process. The human ingredient is the soul of BED|STÜ. Starting with cutting the raw leather to the final finishing process, each piece is stitched, woven, dyed, and finished by hand in the spirit of the cobbler tradition. Even our most intricate designs are meticulously hand-tooled, with incredible precision and skill. Though time consuming, the outcome is a beautiful, carefully crafted piece of art with a human touch that makes each of these pieces one-of-a-kind. All of the woven leather pieces on our products are thoughtfully and carefully woven by hand. This process requires a great deal of patience and skill, but it is a tribute to the artisan craft of shoemaking. Just as makeup will react differently on various complexions, our natural leathers all respond to the dyes and finishes differently. Additionally, because each product is hand-dyed and hand-finished, small variations make each piece truly as unique as every one of us. Each design, color, and finish was inspired by the world around us. From the vibrant colors of the prickly pear cactus to the lightly dusted appearance of artisan bread, every BED|STÜ piece has its own story and unique character. The Goodyear welted construction is the oldest and most laborious method of shoe construction, but it is built to withstand the test of time.